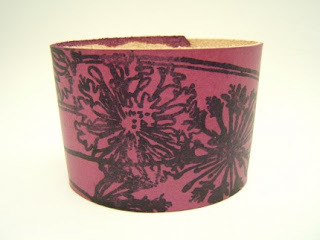 Here is one of my favorite purchases from Etsy: hollyhawk's Floret leather cuff in plum. I love the color, the print and the width. It is impeccably crafted. Wearing it makes me feel girly and hip for which I'm eternally grateful, since my latest look is careworn and haphazard. Thanks Holly! ps. I just discovered Holly's blog! I really appreciate your enthusiasm for the items I make. It’s a real bonus with etsy finding such lovely and talented people as yourself.